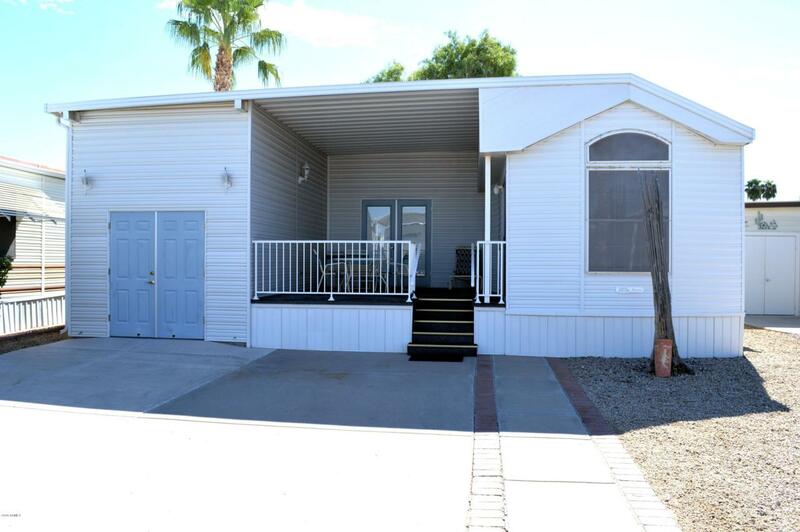 This move-in ready park model w/AZ room gives you plenty of space to move around. One bedroom and 1.75 bathrooms; an indoor washer/dryer; easy access to the shed from inside the home. The front deck is large enough to share with your friends. Oh and by the way there is a rear deck as well. The large AZ room can be used as an extra bedroom with plenty of privacy, its own bathroom and a separate entrance. The location is perfect putting you in close proximity to the neighborhood center where you will find a swimming pool and activities room. Happy Trails has plenty to keep you busy: 4 swimming pools, pickle-ball, tennis, workout room, arts and crafts, library, shuffleboard, horseshoes, billiards and so many clubs to become a part of. You will certainly find what you are looking for.